I can't believe I am almost finished! 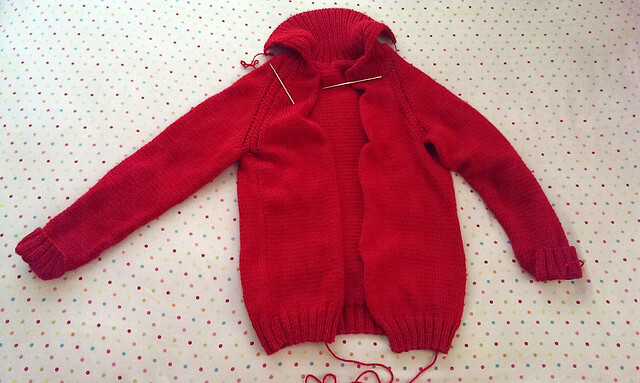 Knitting a sweater was one of those things I was putting off until I felt like a more established knitter. I never really felt more established, so I just went for it, and I was surprised how easily it progressed. I'm following along with the My First Sweater class on Craftsy, and I highly recommend it, if you are a visual learner, like me. Sometimes, just being able to see someone do something is what I need to make a new skill stick. 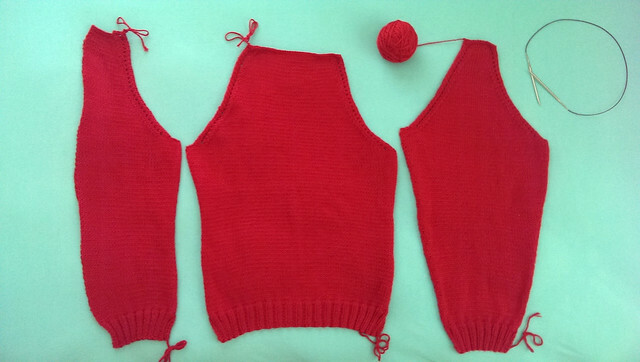 The sweater pattern is free on the Lion Brand site and is the Cardigan Collared Variation. I just finished the collar - my favorite part of the sweater, and am knitting the right front buttonhole band. I didn't think I would like the eyelet detail, but now that I see it all together, I like the subtle texture it creates. I knit a small - what I usually wear in shirts and sweaters, and it is roomy and fits just right. The only issue I see is that the sleeve cuffs fit super-snug, while the rest of the arm is a more relaxed fit. I also knitted a longer cuff on the sweater and sleeve edges - it just looks nicer to me that way. The yarn I chose I am "meh" about - Red Heart Soft. I didn't choose wool because I didn't want to worry about blocking just yet. It also just doesn't get cold enough in South Texas for wool. :) The Red Heart Soft is soft, and washable, and not the least bit scratchy. But I didn't buy all 5 skeins I'd need to finish all at once - I had 2 in my stash, gifted by a friend, then bought a skein here and there. They all had different weights (some bulkier, some more worsted-weight), some felt softer, some more stiff. At least the color was consistent. Really enjoying this process so far! First of all, I went on a yarn binge earlier this week - I found a local yarn store I hadn't visited in ages (since before I moved to New York, actually). The store had moved to a cute old two-story house, and was full of beautiful wools. I didn't NEED any yarn, but since when does that stop me? 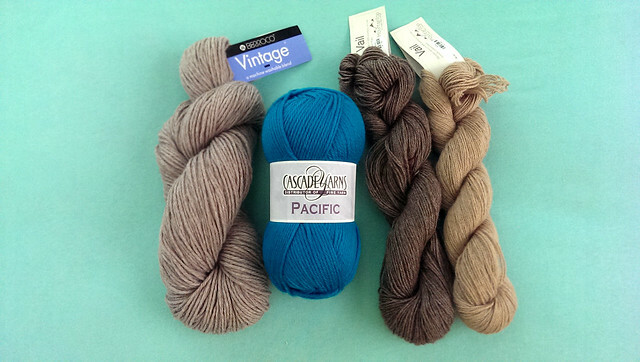 So I snapped up the lovely yarns above. 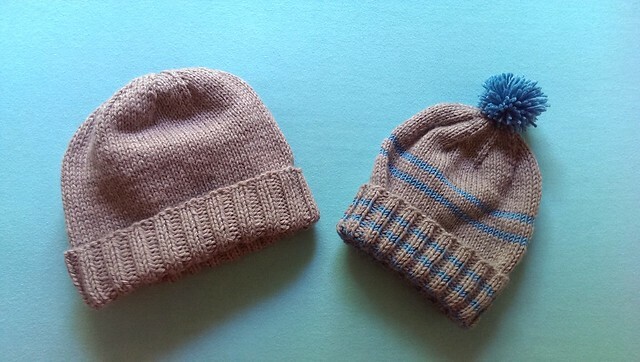 I put one of those yarns to use quickly enough on some last-minute gifts for a dad and baby. 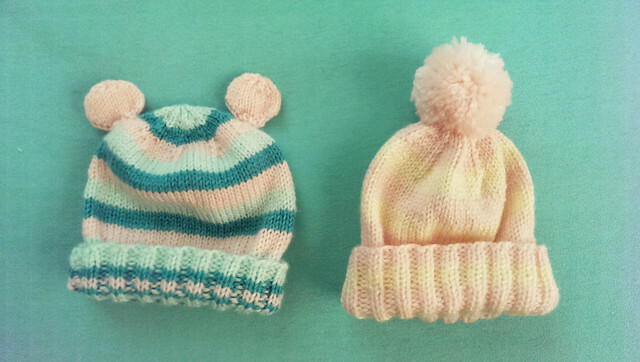 I thought it would be cute to give them matching winter hats (yes, I am aware it's August) because the dad will be spending his first winter in South Korea, and it would be sweet to have baby wearing a hat to match. I used up the whole skein of Berroco Vintage, and added a couple of thin blue stripes and a blue pompom in a wool from my stash.